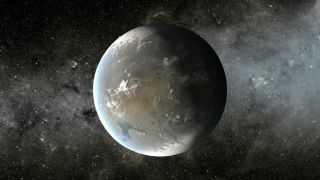 The artist's concept depicts Kepler-62f, a super-Earth planet in the habitable zone of a star smaller and cooler than the sun, located about 1,200 light-years from Earth in the constellation Lyra. Image released April 18, 2013. The recent discovery of three potentially life-supporting alien planets has caught the eye of Congress, which will hold a hearing about exoplanet discoveries today (May 9) on Capitol Hill. The space and research subcommittees of the U.S. House of Representatives' Science, Space and Technology Committee will meet at 10 a.m. EDT (1400 GMT) Thursday for a joint hearing titled "Exoplanet Discoveries: Have We Found Other Earths?" The proceedings will be webcast live; you can follow the House exoplanet hearing here on SPACE.com. The hearing's charter states that its main purpose is to review the April discovery of Kepler-62e, Kepler-62f and Kepler-69c, three "super-Earth" exoplanets that may be capable of supporting life as we know it. As their names suggest, all three were spotted by NASA's prolific Kepler space telescope. "The hearing will also assess the state of exoplanet surveying, characterization, and research; NASA’s Exoplanet Exploration Program; National Science Foundation’s (NSF) Division of Astronomical Science; as well as coordination within the government and with external partners," the charter states. How is exoplanet research conducted and why is it important? How do NASA and the NSF support exoplanet research? What does future exoplanet research hope to discover? Three experts will take questions at the hearing: NASA science chief John Grunsfeld; James Ulvestad, director of the Division of Astronomical Sciences at the NSF; and Kepler team member Laurance Doyle, principal investigator of the Center for the Study of Life in the Universe at the SETI (Search for Extraterrestrial Intelligence) Institute in Mountain View, Calif.
Astronomers have discovered more than 800 exoplanets since spotting the first alien worlds orbiting a sun-like star back in 1995. A number of these planets orbit in their star's habitable zone, that just-right range of distances where liquid water could exist on a world's surface. The Kepler mission has been a big player in this ongoing exoplanet revolution, detecting more than 2,700 planet candidates since its March 2009 launch. While just 132 of these candidates have been confirmed to date by follow-up observations, mission scientists expect that more than 90 percent will end up being the real deal.